Searching for a job online has become one of the easiest ways to do it. 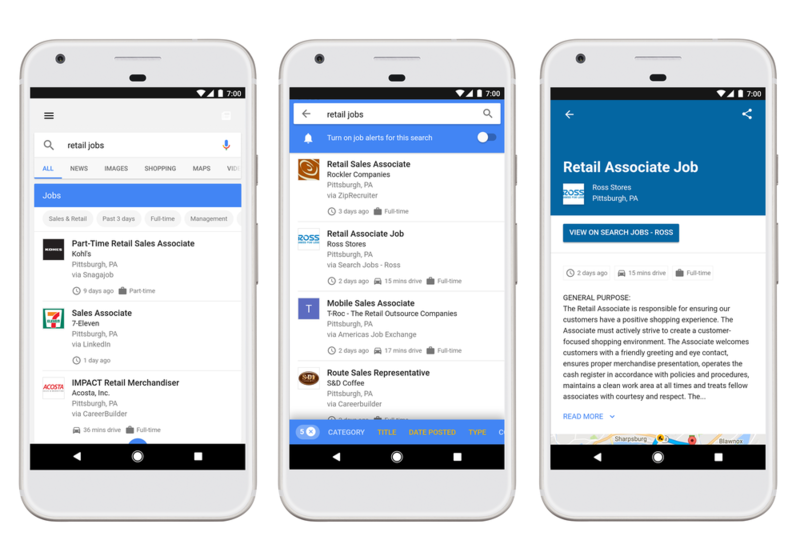 Now, it is more easy with Google’s new tool to find part-time and full-time jobs to every individual who is seeking for jobs. Thanks to the Google’s tool “Google for Jobs” to find work. 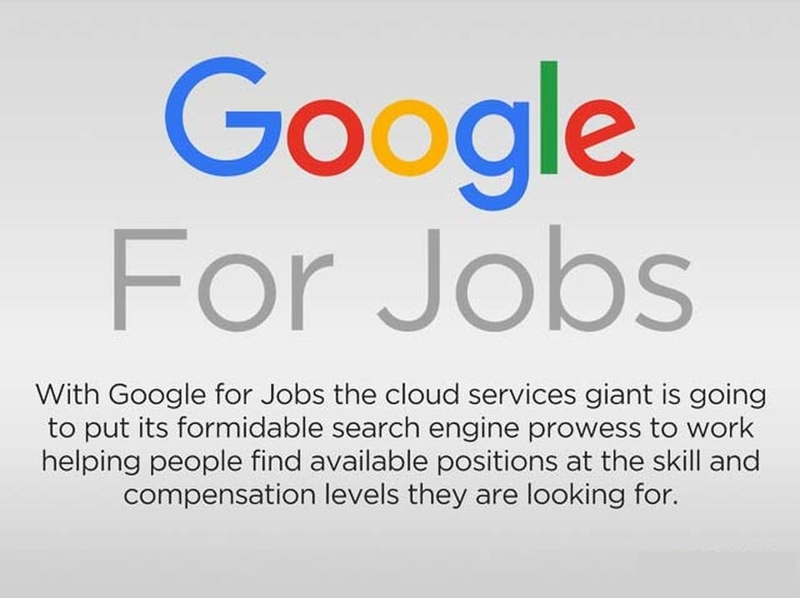 Today, Google has announced its new job search tool for everyone. Whether you are a student looking for a part-time job, an electrician looking for a job near home, or a teacher moving to another state to be close to the family, etc. 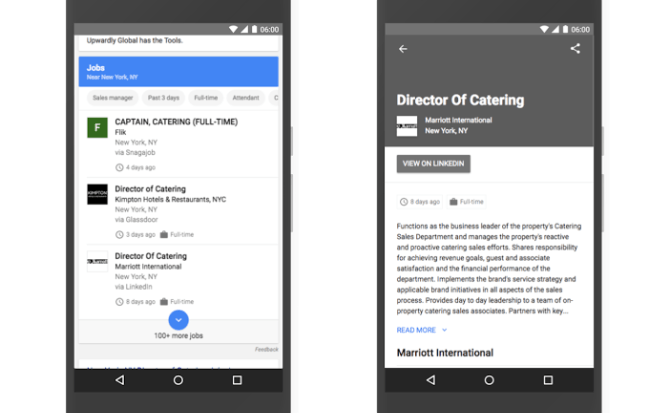 For everyone, Google has launched Google for Jobs, a tool that seeks to help both employers and job seekers. The company introduced the initiative during the Google I / O 2017 annual conference in May, where it made its strong commitment to AI. How Google For Jobs tool work? Users will be able to perform different searches in English such as ” jobs near me “, ” teaching jobs ” or similar. The search engine will show results of job offers from platforms such as LinkedIn, Monster way, WayUp, DirectEmployers, CareerBuilder, Glassdoor and Facebook. The user can adjust the filters to their needs, such as experience or schedule in which it is available. They will also have access to ratings and opinions about the company, and even the estimated travel time from your location to the company. In addition, if the user wants he/she can activate a function that will get notifications by email if new job postings are published. All these tools make finding work with Google more comfortable and simple. Google also announced that it intends to insert more features and information in the future, in order to support this ” new search experience ” that they expect to be “simpler and more efficient .” Also, if you take too much time looking for work and you do not convince yourself, you can pause and when you return to the tool you can see from where you left before. It saves our time and easy to search. At the moment Google for Jobs is only available in the United States. We have to wait to see if it reaches to more countries. If it works well for Americans surely from Mountain View they will decide to take it to other parts of the world. To do this, they explained that they are working with organisations across the industry including LinkedIn, Glassdoor, Facebook, CareerBuilder and many others to ensure that it will be easier than ever to find a job without needing any additional application. This way Google is expanding more and more with its new tools and features. Sooner we all will be able to use those awesome tools to make our work life simpler. What do you think about Google’s new tool Google for Jobs? Is it a good idea? Share your views on the same in the below comments. Which tool or website do you use or used to find your Job through? With the education industry booming there is an ample demand for tutors. Women are natural teachers and they can use their communication skills and knowledge to earn additional income. There are thousands of subjects to choose from.. The timings can be conveniently set to suit the tutor and students. One just needs a functional computer and high speed internet connection to get started. Also it is easy to set up an online profile on tutor platforms like Tutor Hub, Much More, Learningfy etc. to earn from home. If you are a professional writer or looking to turn your passion of composing into a lucrative career then being a freelance blogger or magazine writer can get your monthly expenses covered. Freelance blogging involves writing blog posts for several niches on varied number of business sites. Payment is by hour. Progressive, feminist magazines seek engaging content to reach out to their readers. As a magazine writer, you can choose to write in the area of expertise while earning a steady income. Magazine’s like Women’s Enews, MAMM Magazine, and Parenting Today’s Teen hire regularly. A virtual assistant performs the same job as an office assistance, albeit its online. This includes administrative experience of sending out mails and business proposals on behalf of the client. Covering the social media engagement, managing a business blog, increasing the network of the client by marketing, and making office presentations. Such jobs can be obtained through online job portals or offline advertisements. Companies are always on the lookout for dynamic and result driven websites. You can start your own business by putting your creative designing skills to use. Wages are weekly and calculated on hourly bases depending on the project undertaken. You can look out for job options on freelance websites like Upwork, Guru etc. You can also send independent proposals to companies. If you wish to work in a less competitive environment then startup companies offer projects with smaller budgets. Creating a powerful professional profile on social sites can attract potential clients. You can use your smart bargaining and business skills to sell items. There are several ways to sell items online; you can start with E-bay, Amazon, or start a basic selling station right from your home. Apparel and accessories are good starting points because the market is always bustling. Such online trade can help you earn plenty in commission. You can attract customers by putting up an advertisements and promotions . You can also connect locally by starting out with family and friends. The creation of an attractive website will give a head start your business. If you prefer a quiet life and do want to get into the hassles of managing a full fledged office from home, then turning into an e-book author is an ideal career choice. There are heap of topics to choose from. Children’s e-book writing is one of the popular categories in digital publishing. You can upload your finished copy onto various publishing sites like Kindle, Lulu, and Good Reads. Publishing cost of e-books is relatively lower than paper books. An aggressive promotional strategy can turn you into a successful e-Author. A natural hobby can turn into a money making vocation. Your passion for baking can help you develop a niche blog, ecommerce powered local bakery, or a niche bakery from your home. The talent of clicking exceptional photographs can help you sell digital content online, or enable you to freelance as a photographer. A creative interest in arts can help you start your own art gallery online. The possibilities of creating decent income streams are endless. A functional website and few marketing skills is all you need. You can be Miss Boss by following your dreams, even after becoming a mom. The world has shrunk thanks to World Wide Web, and you can make your presence felt in the virtual world and translate your skills, passhion, and enthusiasm it into a golden opportunity of creating wealth for the happiness of your family. Looking for a job shouldn’t be a full time job! That’s why I am writing this article for the simple search in some websites among all categories of jobs. But, here in this article I am going to suggest you a top 10 most popular job websites that are very useful for your career. Now, the list of top 10 most best popular job websites are dropped down. Indeed is an employment related meta search engine for job related listings. Indeed is top 1 most popular job website with immense of visitors. Almost it have reached 100 million unique visitors every month. Indeed is popular to know the job feeds. Indeed is started on November in the year of 2004. At present indeed is available in 53 countries and in 26 languages. Indeed aggregates job listings from 1000’s of websites including job boards, news papers, association and company career pages. Services include “Job search, Job trends, Resume upload, Storage and search, Salary search, Industry trends, Job competition index and website forums”. Monster is one of the largest employment websites in the world. This is an largest network where people search over a lots of jobs that are available in entire companies. The services made moster website to include in top 10 most popular job websites. Jeff Taylor is the person who founded moster website for employment. Services include” Online employment, Job search, Upload resume, etc”. Career builder is also included in top 10 most popular job websites. Career builder is operated by career builder, is the largest employment website online in the United States, with more than 24 million unique visitors every month and a 34% market share to help-wanted web sites in the United states. Career builder operates websites in 21 countries outside the United states. Services include ” more than 1900 partners as of March 2008, including 140 mews papers and portals such as AOL and MSN”. Glassdoor is an Unites States based Job and career site where employees anonymously dish the pros and corns of the company and bosses of the company. Glassdoor is also named and had a immense of unique visitors every month. This is also good website for career development and stood in all top 10 most popular job websites list. Services include” Jobs search, Companies, Salary, Interviews and also can write a review”. Simplyhired is an online recruitment advertising network and also an employment search website. Simplyhired is also included in top 10 most popular job websites entire internet. Services include ” Job boards, news papers and classified listings, associations, social networks, content sites, job listings and company career sites”. JobDiagnosis has millions of job search online and had almost millions of unique montly visitors. JobDiagnosis is one of the most included one in top 10 most popular job websites as it provides some good features among other websites. Services include” Job search, Resume uploading,etc”. AOL Jobs website is helpful to find job on particular location, skills, title or company name and find your way to the next step of the career. Services include ” Jobs search, News, All stories, Advices, Personal stories, videos and lots more”. Bright, one of the biggest online employment search website. This is also included in top 10 most popular job websites. This website also provides the same features as other websites provide. Just visit and know all the features of this website. Services include” Popular job searches, Current salaries, etc”. Beyond is one of the top 10 most popular job websites for job search online. Find the latest and perfect one for you in this network. Snagajob is the last but not least website that is included in the top 10 most popular job websites. The special feature is local jobs info is delivered time to time to your inbox. Services include” Jobs search, Job tips, etc”. The above all are top 10 most popular websites for online employment search. If you feel any website which is more informative to your use, then let me know in your comments. So, that it will be very useful for the people to get more information online.